The title translates to ''For Ireland I'd Not Tell Her Name. As one story goes, a young man fell secretly in love with a girl. Too poor to support her and too shy to propose, he went abroad to seek his fortune. However, when he returned to claim his beloved, he was shattered to find her married to his brother. Still in love, he composed this song to her but, for obvious reasons, refused to reveal her name." The haunting melody is a traditional Irish slow air that appears in O'Neill's Music of Ireland dated 1850. 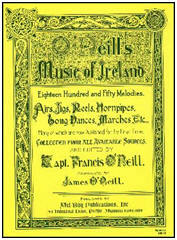 O'NEILL'S MUSIC OF IRELAND (The 1850) was collected over the course of twenty -some -years by Daniel Francis O'Neill, one-time Chief of Police of Chicago, and published in 1903 by Lyon & Healy as a special-interest volume sponsored by the Irish Music Club of Chicago. It has endured over the years to it's Centenary as a useful record of the way Irish-Americans played and perceived the musical tradition of Ireland and of the tunes themselves. Chief O'Neill actually hired Irish musicians onto the police force just so he could "pick their minds" and get more tunes for the club's repertoire... the great Uilleann piper, Patrick "Patsy" Touhey was a Chicago Police member for five years without once "hitting the pavement". D'fhág taomanach breóite lag sinn. Is ar Éirinn ní n-eósainn cé h-í. Ar an taobh thall de'n teóra 'na mbím. But for Ireland I'd not tell her name.